President Paul Kagame has described the unfolding tragedy of African migrants as a test of humanity and collaboration between Europe and Africa. He also said that youth engagement and participation at the centre of the African Union reforms, underway, would make the African Union self-sufficient and more decisive which will bring about more reliability within Africa’s external partnerships. 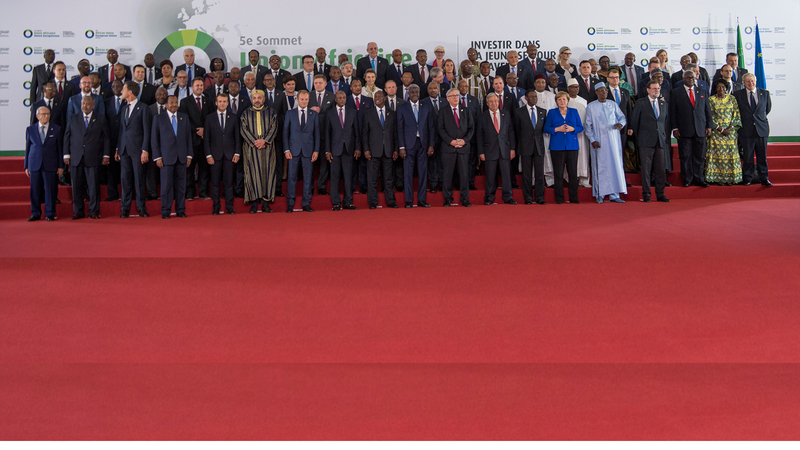 Kagame made the remarks at the 5th African and European Union (A.U.-E.U. summit) held in Ivory Coast’s capital Abidjan on Wednesday, November 29, 2017. He told Africa’s heads of state and European Union officials who attended the summit that the gathering “takes place at a time when we are all looking to consolidate the unity of our respective regions, and also collaborate more effectively, as work continues toward a post-Cotonou agreement”. The African, Caribbean and the Pacific and the European Union Partnership Agreement known as ACP-EU Partnership Agreement was signed in Cotonou, Benin on June 23, 2000, which will expre in 2020. It is the most comprehensive partnership agreement between developing countries and the E.U. Since 2000, it has been the framework for European Union’s relations with 79 countries from Africa, the Caribbean and the Pacific (ACP). He noted that, “The forces reshaping the global economic and security environment mean that Africa’s future increasingly depends on the quality of cooperation within our own continent, first and foremost. This includes, critically, our responsibility to mobilise the resources to pay for important programmes that benefit our people, while alleviating the burden on our partners”. Kagame is of the view that the reform of the African Union represents a landmark opening to strengthen the partnership between Europe and Africa, highlighting the gradually developing problem of African migrants in Libya as a test of the collaboration and humanity between Africa and Europe . “Europe and Africa are permanent neighbours, and we have a shared understanding of numerous key interests, notably in terms of security, migration, environment, trade and investment. In this regard, a test of our collaboration and our humanity lies clearly before us, with the unfolding tragedy of African migrants in Libya, and in similar situations elsewhere. We must act together,” he stressed. The partnerships between Africa and the external world will be more reliable and favourable when the African Union is more decisive and self-sufficient, Kagame said. He insisted that a more decisive and self-sufficient African Union will mean more favourable and reliable external partnerships for everyone involved. “After all, why would anyone want to work with a not so organised or inefficient partner?…continued cooperation and understanding from the European Union is an important factor in the success of this effort”. Kagame also stressed the inclusion of the African and European youths in determining the success of the African Union reforms and in the future successful partnership between the two continents. “It is no accident that the institutional reform puts youth engagement and participation at the centre,” he said, ending that “Guaranteeing opportunity, safety, and voice to the young people of both Europe and Africa, is the best defence of our shared values, and our common future”. In 2010, the African, Caribbean and Pacific (ACP) and European Union (ACP-EU) agreement has been adapted to new challenges such as climate change, food security, regional integration, State fragility and aid effectiveness.